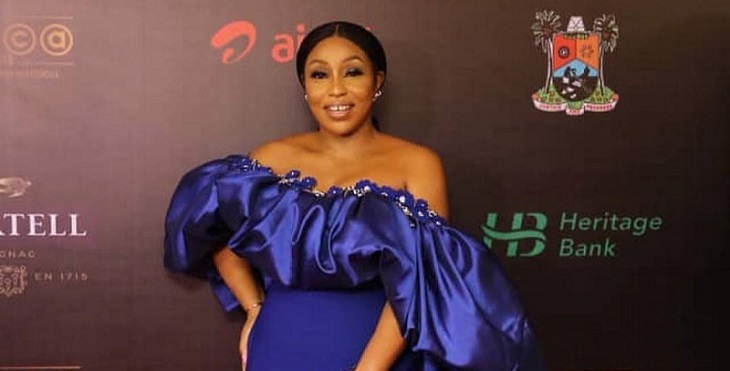 Rita Dominic has been turning heads on the red carpet for years, and she has done it again in a bold blue dress. The 43-year-old actress stepped out in Lagos last night for the annual Africa Magic Viewers Choice Awards, wearing a traffic-stopping off-the-shoulder ensemble with puffy ruffled bodice which gave the actress a wow-factor. Just look at the gorgeous dress. Hailing from Tubo’s ‘her form 2018 collection,’ this number was pulled together with a coveted piece of clutch bag and seems to be created in lightweight satin with an airy silhouette. It’s the perfect piece for any swanky events. We adore the minimal yet chic aesthetic and, of course, the blue ruffles, which proves to be an incredible work of art. And we can’t help it but think Rita Dominic deserves the best-dressed among her colleagues. Seriously, its time to think blue! Click here to see what everyone wore to the biggest night in Nollywood.